The end of winter break and the start of spring semester not only means coffee sales in the local Saratoga district will spike again, but it also indicates the season midpoint for a handful of Skidmore’s varsity teams. To keep avid sports fans up to date on all the happenings, the Skidmore News has created a recap of the winter sports teams and their seasons so far. The Skidmore College’s women’s basketball team is looking to make another NCAA Division 3 Tournament appearance this season. Hoping to defend their Liberty League title for the third year in a row, the team is led by seniors Haley English ‘19 and Taylor Ong ’19 with eight players returning. Last year’s team went 18-10 and earned the regular and postseason Liberty League title. Currently, the team stands at eighth in Liberty League standings with six games to go and a record of 5-14. Despite playing a tough non-conference schedule in the beginning of the season, the women have shown great resilience by beating the Rochester Institute of Technology (RIT), which is nationally ranked, and Rensselaer Polytechnic Institute. Jessica Centore ‘20 alongside English lead the team with a scoring average of 8.9 and 8.2, respectively. On Feb. 1, the Thoroughbreds will head to Ithaca to take on their second seed team. On Feb. 8, the team will head to Geneva to face William Smith College, who currently sits at third in the league. The team will face RIT (Feb. 8), Clarkson University (Feb. 15), and St. Lawrence University (Feb. 16) before moving onto the first round of the Liberty League Championships. 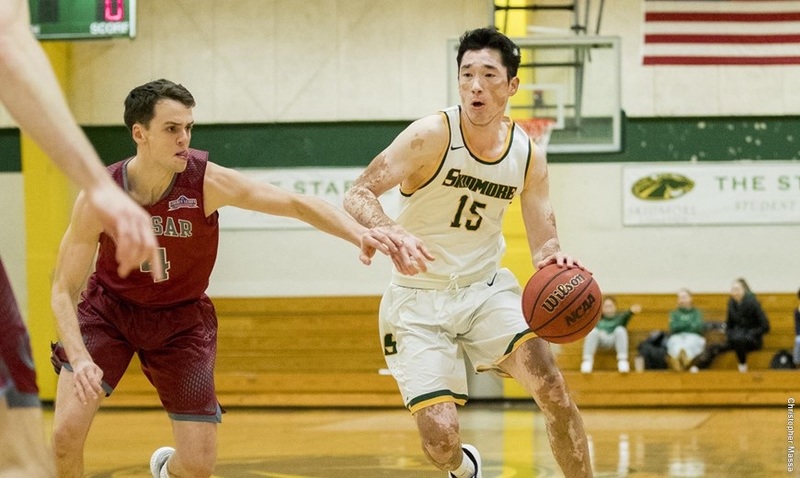 Skidmore’s men’s basketball team is 12-6 and first-place in the league standings, just one win ahead of St. Lawrence University. After making a long Liberty League Tournament run and advancing to the league championship game, the men’s team is looking to secure a fifth Liberty League title and sixth NCAA tournament spot. Leading the team are seniors Jack Byrne ‘19, Edvinas Rupkus ‘19, Chase Ta ‘19, and Charlie Williams ‘19. Starting off the season with a 6-0 record in conference play, the team has been strong from the beginning. Sophomore guard Noah Meren ‘21 is the team’s and conference’s leading scorer, averaging 25.3 points per game. Rupkus and Greg Skoric ‘22 are averaging 16.7 and 15.6 points per game respectively. Earlier this month, Skidmore beat Union (90-83) and RPI (70-69) to end the first half of the league season. Winning against the same teams this past weekend, the Thoroughbreds are looking strong coming into the final half of the season. They will head to Ithaca to play their team on Feb. 1 before heading to Annandale-on-Hudson the next day to play Bard College. The team will play four more games facing Hobart College on Feb. 8, RIT on Feb. 9, Clarkson University on Feb. 15 and St. Lawrence University on Feb. 16 before competing in the first round of the Liberty League Tournament. After making the New England Hockey Conference (NEHC) Quarterfinal and losing to Babson in a 3-2 double overtime game, the Skidmore men’s hockey team comes into the 2018-19 season strong. The Thoroughbreds sit at fifth in the NEHC, with a record of 11-8-2 and six games to play. Since earlier this month, the team has been successful, winning against Castleton (5-1), Hobart (3-2), and Southern Maine (4-1). Seniors Max Hegge ‘19, Corey Morgan ‘19, and Adam Moodie ’19 lead the team this year and offer valuable experience to the new team. The Thoroughbreds welcome eight freshmen and return 18 players from last year, including seven of their top scorers. Sophomore forward Matt Muzyka ’21 leads the team in scoring and is 10th in the NEHC with nine goals and nine assists. Brandon Borges ’21 trails behind with five goals and 11 assists, followed by Austin Rook ’22 with five goals and nine assists. Goaltender powerhouse Brandon Kasel ’20 is 7-5-11 with a 2.77 goals against average (GAA) and .912 save percentage. The Thoroughbreds return home to play UMass Boston on Feb. 1 and Babson College on Feb. 2 at the Saratoga City Rink. The following weekend, they will look to defend their home rink against Suffolk University and later Johnson & Wales University. The New England Hockey Conference tournament is set to start on Feb. 16. Skidmore’s men’s and women’s swim and dive teams are fresh off of a training trip and gearing up for the Liberty League Championships at the end of February. The team is led by seniors Alex Cooperman ‘19, Claire Stetten ‘19, and Owen Kula ‘19. The men’s team showed a strong effort from the beginning of the season, picking up a pair of victories against St. Lawrence (120-100) and SUNY Potsdam (156-138). The women’s team also showed a solid effort falling against St. Lawrence (127-107) and earning its first win of the season against SUNY Potsdam the next day (193-96). The women’s team is 3-4 and the men’s team is 4-3. The team welcomes nine freshman women and two freshman men, and returns 15 women and 11 men. On the men’s team, senior record holders Harrison Shockley ‘19 (100-yard backstroke) and Hiro Kamei ’19 (100-yard and 200-yard breaststroke) return to the team after both earning podium spots at the Liberty League Championships last year. Juniors Elizabeth Levy ’20 and Meredith Wagner ’20 also return to the team with school records in the 200-yard butterfly, and 100-yard and 200-yard breaststroke, respectively. Junior divers Hannah Krall ’20 (record-holder on the 3-meter platform) and Rachel Adamsky ‘20 look to continue their solid effort on the boards. Skidmore’s lone male diver Andrew Klein ’21 looks to improve upon his great freshman season. Both teams will host the annual Skidmore Sprint Invite on Feb. 2 to finish the regular season. .